By most recruiting analyst opinions the 2008 Notre Dame class was the most talented for the school in the period between the #1 class of 1995 and the most recent 2019 class. It was the class that firmly cemented Charlie Weis as an ace recruiter who could talk the talk. Over a period of nearly a quarter century the 2008 class remains the highest peak for Fighting Irish recruiting and today we will look back at many facets of this tremendous haul. This was Charlie Weis’ 3rd full recruiting class and 4th overall after being hired ridiculously late in the 2005 cycle–remember Weis attempted double-duty but remained officially with the New England Patriots through their Super Bowl win on February 6, 2005 four days after National Signing Day. It would be the best of a very strong 4-year run that was impressive for the staff’s ability to keep the class together following the disastrous 2007 3-9 season. According to Rivals, the Irish would finish as the #2 team in the rankings behind Alabama. The 247 Composite in hindsight had Notre Dame behind Miami with the Tide dropping back to #3 nationally. However, both Alabama and Miami featured 9 more recruits apiece over Notre Dame. The Irish featured an average rating of 93.01 which only trailed USC’s 19-man class (#4 Composite) for 2008 and pulled off a feat that we really haven’t seen since in South Bend: Both a large (for today’s standards) and top-heavy class in terms of talent. Notre Dame’s 2008 class was 86.9% blue-chips from 23 players which is a tremendous mark and most years would guarantee a Top 10 class no problem. Yet, it was the top of the class that made Notre Dame special, including 9 players inside the national Top 100 rankings: Michael Floyd #19, Dayne Crist #22, Kyle Rudolph #29, Ethan Johnson #36, Darius Fleming #63, Trevor Robinson #85, Steve Filer #88, Deion Walker #90, and Jonas Gray #92. Jamoris Slaughter #115 and Braxston Cave #117 were no slouches either and helped prop up the Irish class at the top. As is often the case, a handful of teams scooped a large quantity of the Top 100 players. Notre Dame, Florida, Miami, USC, and Ohio State signed 44 of the players overall. 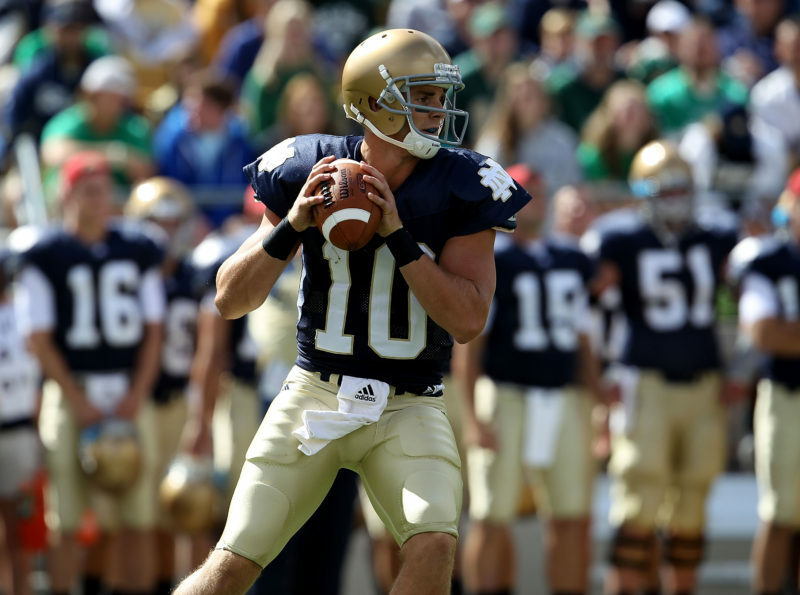 I was curious to look at Notre Dame’s 2008 class in a macro sense. We know it’s agreed as the best for the Irish in a very long time but where does it rank against other schools in recent memory? *Only 12 programs have achieved a 290 score in a single cycle over nearly 2 decades of recruiting: Alabama, USC, Florida, FSU, Texas, Georgia, Ohio State, LSU, Miami, Michigan, Notre Dame and Tennessee. *The 2000, 2001, and 2005 cycles featured no teams with scores that reached 290 points. *The SEC has totaled 23 out of the 50 teams with a score of 290 points. *The top 7 scores all come from SEC teams and that conference holds 8 out of the top 10 scores. The exceptions being 2018 Ohio State and 2006 USC. *The 2018 Ohio State score is the only one in the Top 10 that didn’t finish 1st nationally in recruiting for a given cycle. They were beaten out by Georgia two cycles ago. *Alabama didn’t have a 290 score class from 2000 through 2007. Since then, they’ve reached that mark 9 out of the last 12 cycles. When the Tide lost their recruiting crown in 2018 it prevented a run of 9 straight years with classes of at least 290 points. *The Pac-12 is tied with the ACC with 8 years apiece from the top 50. However, all 8 in the Pac-12 come from the Southern California Trojans. Some prefer to look at recruiting player average instead of total points which rewards class size. And there were some enormous 30+ player classes earlier this century. *Using player average the top of the rankings are a little more diverse. The SEC only has 6 out of the Top 10 and 3 out of the top 5 are not SEC teams. *The highest player average for a class this century goes to 2017 Ohio State, and that class included a kicker from Buffalo (shout out to Canisius High School). *2017 Ohio State is one of 4 classes in the Top 10 for player average this century who didn’t have the top class in their cycle. The others include 2018 Ohio State (mentioned above), 2018 USC, and 2010 Texas. *4 programs, all from the state of Florida, finished with 290 points but a player average under 90.0 points: 2004 Miami, 2008 Miami, 2007 Florida, and 2003 Florida. The last 3 listed were the top-ranked classes in those years, too. 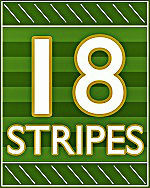 They achieved that feat based off an average of 29 players signed in those cycles. Perhaps one of the things that jumps out is how the more recent seasons are mixed in among the top classes since 2000. For overall Composite Score, 10 of the top 15 classes have come since 2014. For player average 8 of the top 10 classes have come since 2014. Notre Dame hasn’t been able to secure a class as good as 2008 for a myriad of reasons but the other blue-bloods, particularly in the warm weather areas + Ohio State have definitely taken their recruiting game up to another stratosphere in the last decade. Luck of the Irish? Looking back, there is no doubt that the Charlie Weis regime recruited really well but in tandem with my point above you have to wonder how well this Weis-led Notre Dame recruiting machine would do a decade later, especially coming off a 3-9 season. Here are the home states for the 2008 Irish signees: CA (3), IL (3), OH (2), IN (2), MN, OR, NE, VA, MI, GA, MD, NC, KY, TX, NJ, CT, PA all 1 each. Obviously, Florida is conspicuous with its absence. The class does have a bit of a Midwestern/Northeast flavor in a way that isn’t always present in classes during the Kelly era. A huge take away for me is how ‘lucky’ the Irish were to hit on elite talent from states that aren’t normally producers of quality talent. *For the state of Minnesota, Michael Floyd is the 2nd highest rated recruit trailing Seantrell Henderson from the 2010 class. *For the state of Oregon, Ethan Johnson is the 4th highest rated recruit. *For the state of Nebraska, Trevor Robinson is the 2nd highest rated recruit trailing Baker Steinkuhler from the same cycle. What a year for the Cornhusker state! *For the state of Illinois, Darius Fleming is the 13th highest rated recruit for a state we’ve chronicled has slowly been losing its influence for Notre Dame. In my previous two recruiting articles (Targeting High Schools & Falling Rate of White Players) the changing demographics of the United States was covered in some detail. I was curious to compare 2008 to 2019 specifically to see any differences. One thing that sticks out is how much more geographically diverse the 2008 cycle was compared to today. Some of this could be anomalies of course but I think they are clearly indicative of a larger trend. 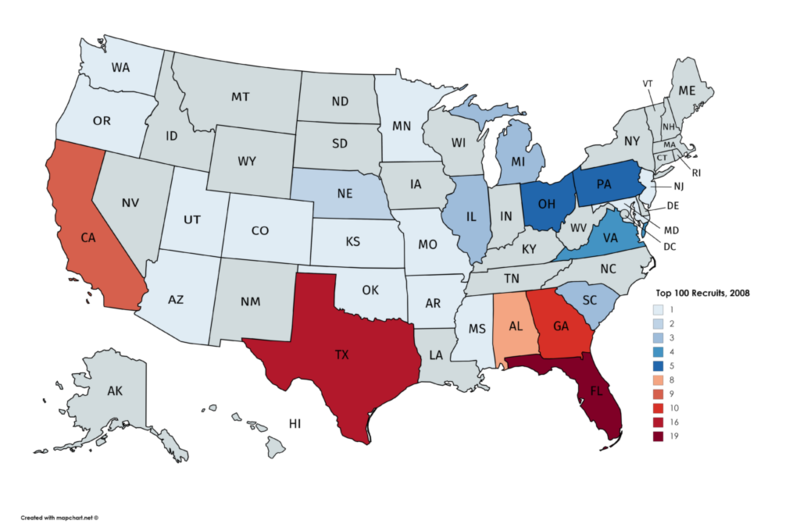 In comparison, 2019 has 2 fewer states overall on the map. 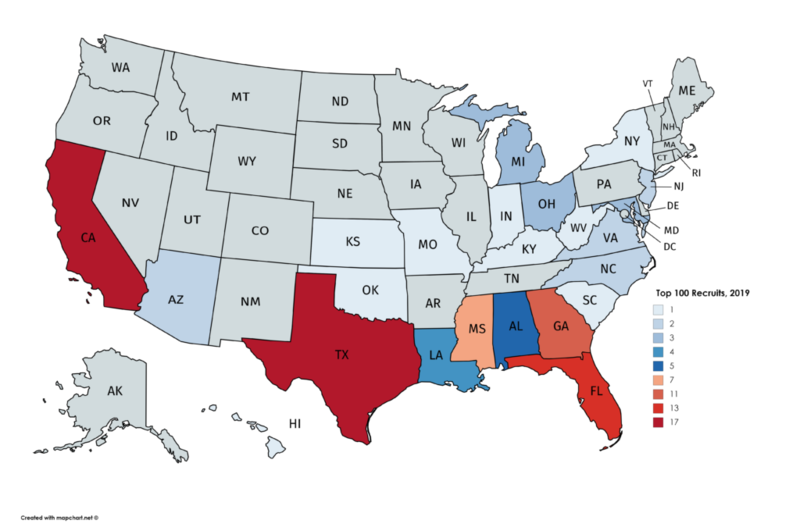 Pennsylvania, Illinois, Nebraska, Arkansas, Colorado, Minnesota, Oregon, Utah, and Washington dropped out completely from 2008 and were replaced in 2019 by Louisiana, North Carolina, Hawaii, Indiana, Kentucky, New York, and West Virginia. Florida did fall from 19 to 13 within the Top 100 although that may be a blip on the radar. Even including 2019, the state of Florida has averaged 17.5 Top 100 recruits since 2016. 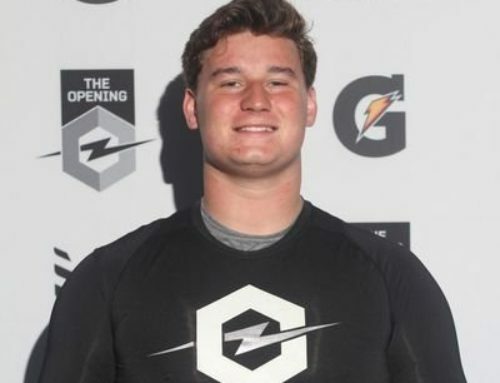 California had a huge year for 2019 with 17 of the top 100 recruits. Although only 9 recruits was a touch low in 2008 that state has been averaging nearly 12 Top 100 players per year over the last 10 years. The 2008 Irish class was pretty successful, at least on an individual basis. Michael Floyd and Kyle Rudolph were some of the best at their positions while in college. Ethan Johnson and Darius Fleming didn’t quite live up to their recruiting rankings but were solid starters at least, while the latter is probably one of the more underrated Irish players this century. It took a while but Jonas Gray exploded during his senior season before a knee injury ended his Irish career. Jamoris Slaughter and Braxston Cave were very good starters. The same goes for Robert Blanton. Two out of the 4 lowest rated recruits of the class in Kapron Lewis-Moore and Mike Golic, Jr. hung around long enough to be starters on the 12-1 team that faced Alabama in the 2012 National Championship. Due to the similar name and home state Filer gets mixed up with Fleming sometimes. Yet, Fleming finished with 32 tackles for loss over his career. Filer virtually never played serious snaps and finished with 38 career tackles, most of them on special teams. Forever a workout warrior who always seemed one game away from impact, it just never happened. On a recent Irish Illustrated podcast the comparison between Walker and current Irish sophomore Kevin Austin came up. They were similarly ranked nationally and had similar body-types, although Walker was a bit taller and lankier. Austin should have a far, far better career because Walker only played in 7 games, caught 1 pass, and that’s with spending 4 years on campus! Walker transferred to UMass to finish his career and final year of eligibility where he caught 59 passes in 2012. The payoff from the hype here was quietly worse than Jimmy Clausen recruited the prior year–at least Clausen destroyed records in high school (9,871 yards, 136 touchdowns his final 3 years) and dominated at the college level in 2009. Crist was underwhelming as a passer in high school (3,448 yards, 56.1%, 33 TD his final 2 years) but certainly had the size, looked the part, played at Notre Dame High School, had the name, and was athletic enough to think he’d run really well in college. It’s pretty crazy that Crist had just a little over a half of a season of starting at Notre Dame. His career remains a puzzling “what if” for those early Kelly years. Thanks for the memories. I tutored some of these guys – they had great attitudes, worked hard, and were fun to be around. This recruiting class is a major reason that I have to take deep breaths and step outside when people maintain that we can’t recruit elite players. The academic standards at ND are higher, but are not that much higher, than they were ten years ago. As you point out, the class certainly speaks to demographics / luck that aren’t there anymore. But – there’s always a but – Weis was able to attract offensive skill, and I have to believe that even if said skill is from the south, and not Pennsylvania, a comparably famous offensive mind (you know, someone who bestows a decided schematic advantage) would be able to do the same at ND. I don’t know if Kelly was about to breakthrough on this when the 2016 disaster happened and sank Kizer’s ND career (along with so many other dreams) but when I think on some of the comments around offensive skill – and see the rankings of Floyd and Rudolph – it becomes clear to me just how much we’ve been missing elite skill players. And I do think that’s on Kelly. Do we think Kelly will get over that hump? Or are his best recruiting days behind him? Take a risk and make a prediction! I predict our recruiting rankings climb modestly and this year’s class is in the top ten (probably at #10). That’s not anything scientific, but I’m hoping the last couple years of success and continuity pay some dividends. Here, ehh, I’m not so sure. As Eric speaks to in the article with changing demographics, you’re not really seeing Floyd and Rudolph level talent (i.e. WR, TE that are top-25 ranked) being produced from north of the Mason Dixon line all that much. If that caliber player was still frequent, I would agree with you it’s more a Kelly problem. Weis in ’08 didn’t have to compete with Urban Meyer at tOSU, Penn State was in late-Paterno malaise and Michigan was what in Lloyd Carr/Rich Rod days? So regionally ND was in a much better position too at the time to get that perfect storm of having a very good recruiter in Weis and be able to position Notre Dame in a unique way. I don’t think there’s much reason to believe anything will be different, Kelly will recruit top-10ish classes that puts ND on the edge of contention with blue chip ratio, but certainly not be up there with the elite, elite Bama/UGA/tamu/Clemson type mega-classes of the past few years. Depressingly, due to demographics and institutional constraints I wonder if that is sort of the modern ceiling for ND Football as well. If Kelly moves on in a few years and they get PJ Fleck or Matt Campbell from Iowa State, would a young, energetic coach be able to improve at all? Seems like a tough task and easier said than done. Certainly interesting food for thought. Top 10 would be an improvement over the last couple classes, so I’d certainly take that for a start. I gave myself wiggle room with top-10ish 🙂 so I consider the recent rankings of like 11, 13, 14 to be within that range. Personally with rankings and class size I don’t mind where they’ve been on the lists, as long as the blue chip ratio improves and gives them (in theory at least) a chance to be competitive against top teams while winning double-digit games consistently on their schedule. Just personally I consider it on the right path whether that means getting #12 or #6 ranked classes from the recruiting services. 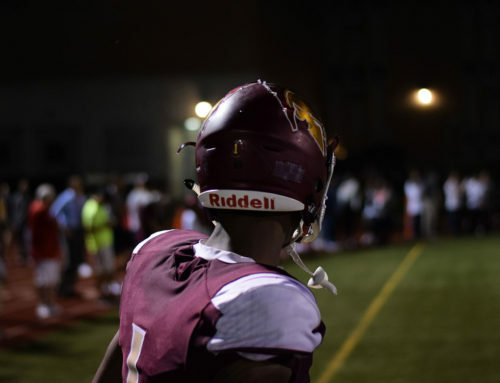 Full disclosure I cancelled 247 sports, so I’ve taken a big step back in following recruiting this year (it’s quite refreshing), but how would a class with Chris tyree, aj Henning and Jordan Johnson plus the two tight ends compare to the 08 class? Kelly was recently quoted as saying something to the effect of they need a Michael Floyd and will fuller type on the same team. I mean that seems pretty obvious but maybe they can really emphasize that in the upcoming classes because skill talent has been pretty underwhelming for a while. Hmm… Let’s make some assumptions and take a look at the two RB/WR/TE groups. This is a tough call. Tyree maybe gets a tiny edge over Gray because he has elite-plus speed – had the fastest 60M time in the country this year. Johnson is behind Floyd but not by much. Henning (assuming recovery from his hip issue) and Redding are better than Walker and Goodman. Mayer and Bauman are probably both roughly Fauria-level prospects, which is good, but not Rudolph. I’m tempted to call it a push. It’s really close. 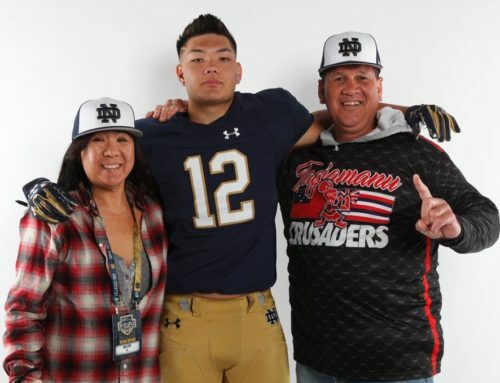 Looking at the class as a whole, I can see a slightly but not wildly optimistic path to a class rating of about 294 (using the 247 class calculator, https://247sports.com/college/notre-dame/Season/2020-Football/Commits/Preview/). I don’t see us getting above that realistically, so the high end isn’t above 2008, but it’s pretty close. Right, but can any of the 2020 recruits fair-catch like Goodman? I doubt it. What is crazy to me, is that I consider this past class the best one since the Jaylon class (or at least about tied with last years as the best since then), but it is one of, it not the, lowest ranked class in BKs tenure. I think that is because this is how the Patriots are built — few stars, but good players and depth across the board (with basically no concern for skill positions) — while the rankings really value 5 stars. Basically every player on the Pats is the NFL equivalent to #100-300 recruits… plus Tom Brady…plus Bill Belichick. Well, Book is from pretty close to where Brady is from, and Belichick is friends with Bon Jovi… so yeah, we’re all set. This year’s staff has been so aggressive with recruiting. It appears to identify ND type kids much earlier in the process. I think all of those factors point towards an upwards trend in recruiting. I don’t know how it will compare to the 08 class, but I bet it will be pretty good. These articles are really tremendous. To repeat what I said on the last one: this is what pay sites should be doing (at least occasionally), but don’t. I’m happy someone does (and does it well!). Thanks for putting them together! And then, there were 85 schollies.